A month or two ago one of my friends decided she was going to be vegan after reading a book about something. She never said what the book was. This was not too long before valentine's day, and since I usually take the treats I make to lunch with me, I felt bad if I took treats I couldn't share with everyone at the table (since they all eat nuts, I don't worry about those like I did in the past when I ate lunch with a nutty anti-nut friend). I checked out Vegan Cupcakes Take Over The World from the library last year because with a title that cute how could I resist? However, being anti-margarine and shortening, as well as an omnivore, I never did anything but flip through it. But I'd tabbed pages that lacked offenders and wanted to try them. But then I returned the book. So when my friend mentioned being vegan, I figured it would be a nice surprise. So I checked out the book again, picked out my recipe for an icing (Super Natural Agave Icing), and bought everything for either vanilla or chocolate cupcakes. Then I reread the recipe: soy milk powder. And I began a three-week quest for the stuff short of ordering ten pounds of it from the internet. I only needed 1 1/2 cups. So then I gave up, but the plain soymilk was still sitting in the basement fridge. In the past I've enjoyed soymilk in my cereal, but that's because vanilla soymilk is sweet and I didn't want to open the soymilk until I knew I could finish it. Unfortunately, it's almost March 11th, the date on the package. 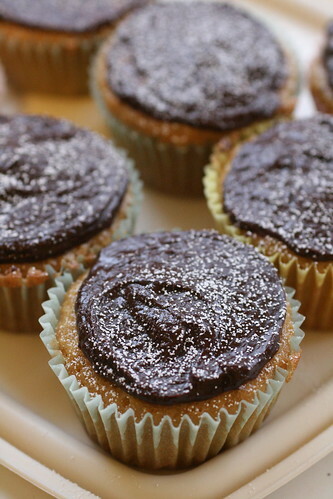 So it was time to make the cupcakes, and the chocolate ganache to match. My dad said these seemed like corn muffins to him. They weren't patient enough to wait for them to cool or for me to ice them this morning. When I had one, I pinpointed the flavor. It was a mild flavor from the soy milk. Preheat oven to 350ºF. Line muffin pan with liners. Whisk the soymilk and vinegar together in a measuring cup and set aside a few minutes to curdle. Whisk together the soymilk mixture, oil, sugar, and vanilla extract and other extracts in a large bowl. Sift in the flour, cornstarch, baking powder, baking soda, and salt and mix until no large lumps remain. Fill cupcake liners 2/3 way full and bake for 20 to 22 minutes or until done. Transfer to cooling rack and let cool completely before frosting. Note: It makes more than enough for 12 cupcakes, so I made truffles, like suggested in the book, with the leftovers. It suggested using a chocolate with up to a 60% cacao content, but the lowest vegan chocolate I had was 70%, and I wasn't about to compromise the vegan value of the cupcakes after getting this far. And one of my friends said she likes the ganache topping better than a buttercream anyway, so I guess it was worth it. In a small saucepan bring soymilk to a simmer. Remove from heat and add chocolate and syrup. Stir until smooth and set aside until ready to use.